The 24-year-old Italian captures his second ATP Challenger title. 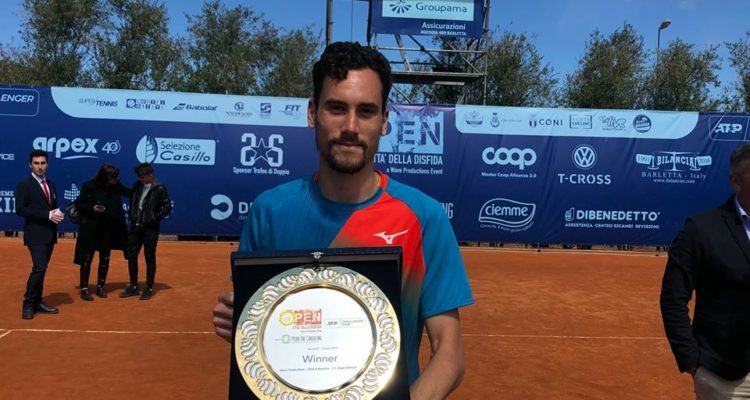 Gianluca Mager has backed up his good start into the season by lifting his second ATP Challenger trophy at the €46,600 Open Città della Disfida held on clay courts in Barletta, Italy. The No. 8 seed benefited from the retirement of Nikola Milojevic of Serbia, leading 7-6(7), 5-7, 3-2 in Sunday’s singles final. Milovic hit the umpire’s chair in the fourth game of the final set and was forced to stop playing due to a left elbow injury. Mager advanced to the title match after a first-round bye with wins over Pavel Kotov from Russia, Aussie Thanasi Kokkinakis, fellow Italian Stefano Napolitano and Viktor Galovic of Croatia. The 24-year-old Sanremo native captured his maiden Challenger crown at the beginning of the year at the Koblenz Open. In-form Mager also reached the quarterfinals four times in a row at Bangkok, Yokohama, Marbella and Sophia Antipolis last week. The World No. 175, who earned €6,190 in prize money as well as 80 ATP-Ranking points, will next spend one week at home before returning to action at the ATP Challenger in Francavilla. On Saturday, Denys Molchanov from the Ukraine and Igor Zelenay of Slovakia clinched the doubles title. The top seeds edged past Tomislav Brkic of Bosnia and Herzegovina and Tomislav Draganja from Croatia, winning 7-6(1), 6-4. The enounter lasted one hour and 13 minutes. This entry was posted in ATP Challenger Barletta, ATP Challenger Tour and tagged ATP Challenger Tour, Barletta, Gianluca Mager.